I’m not a control freak. I’m really not. Chaos and messes of many types do not perturb me. But my coffee? Better to let me brew it myself. That way, I ensure a tasty cup of joe and cost savings – a perfect combination. Don’t take me for someone who is so incredibly particular; when I have a few extra bucks to spare, I go to my fair share of coffee shops. Even then, though, I’m selective. Coffee should taste good, after all, and if a barista doesn’t know how to pull a proper shot of espresso, if I end up with a watery concoction that looks like tea and has no crema, I’ll be disappointed. No one wants that. When I recently started a new job, my coffee love caused some anxiety. 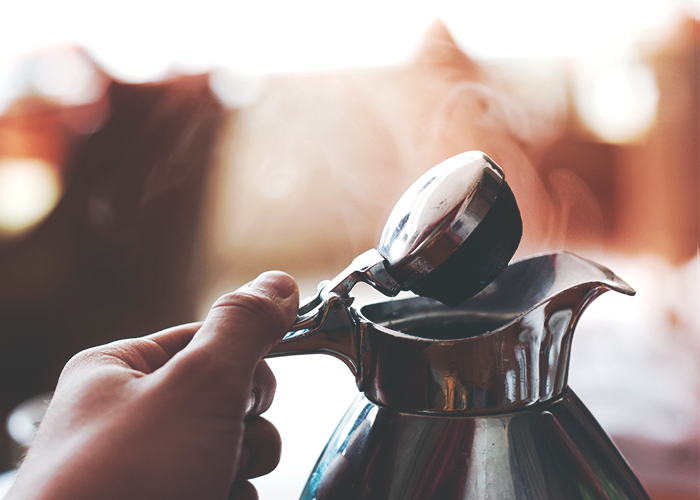 Without unfettered access to a coffee maker, how does a caffeine addict manage? And when mixing with new people for the first time in a work environment? It’s best to tiptoe. After about a week, I admitted my problem. I couldn’t afford twice daily coffee house runs, but I needed caffeine. I was put in charge of the coffeemaker and assumed responsibility for making coffee each morning (which was, of course, my second cup of coffee…) for everyone in our small office. My boss liked my coffee. I don’t say this merely because he drank it. I actually overheard him quietly tell our administrative assistant one day, with some surprise in his voice, “That (insert name brand here) coffee is good!” I was delighted. Forget my degrees, salary, and position – I brewed coffee that people liked to drink! What more could I want? My vacations were met with dismay, not because I would be missed, but because I wouldn’t be there to make the daily jolt. “But who’s going to make our coffee?” the team would ask, and I’d feel slightly guilty for abandoning them. All went well for a time. Then one day, my boss stopped drinking my coffee. Like a wife whose husband goes seeking other women, I’d watch as he’d leave the office and go to Starbuck’s or one of the locally owned coffee shops nearby. Abhorring confrontation as I do, I let it happen, not questioning him. But a clear shift had occurred — my boss no longer drank my coffee. I could think of only one thing: when we started “puppy training” with our first rescue, the trainer said, “For these first few weeks, you must literally feed your puppy out of your hands. You hold the food in your hands and let your puppy eat it. They must learn to depend on you. The person who controls the food has the power.” The person who controls the food has the power. My boss, for whatever reason, had started to read my actions through the lens of office politics. Nothing says, “You’re not the boss of me!” like opting out of the food and drink provided by another person. Of course, in our office, I hadn’t been jockeying for power — I simply wanted to brew coffee and make people happy. Why, you may ask, had I not simply pursued a career at a coffee shop, then? I was five years old when my father asked, “What do you want to be when you grow up?” This question had never been posed to me before, but I had thought about it, and I was happy to share the idea that had been in my 5-year-old heart for some time. I was sure of my intended position in life and looked forward to being big so that I could work. “Oh, but I do!” I insisted. “They don’t make enough money,” my father replied, ending the conversation. So, at 5, my dream of making and serving coffee was killed. No matter that accompanying my mom to our local Friendly’s restaurant every morning so she could have her coffee and I could have a small glass of orange juice was my favorite part of the day. It didn’t seem to matter that the smiling waitress who served us had influenced my desire to bring sunshine and happiness to customers. Ever since, I’ve been groping for another path to follow. I’ve assuaged my sorrow over losing my desired career by making coffee for friends, family, and coworkers. It had been a manageable Plan B — until the day my boss gave up drinking my coffee. Something had gone wrong. Had I made him mad? Was he unhappy with my work? Indeed, it was not long before we were informed that our boss had accepted a new position. With his departure, we were thrown into a bit of mess. Who is in charge when the boss abandons the office? The administration named a regional manager to have responsibility for our small office. She was nice, but far away. Soon after, an assistant director position for our office was posted. I applied. The administrative assistant applied for this senior post as well. “We’ll just see who they hire,” she said, disregarding my years of experience and advanced degree. She did, after all, run the office and felt she should be boss. The first thing I noticed was that she started to brew her own coffee. Then she started the silent treatment. Then, somehow, any word that came out of my mouth smacked of misinformation and idiocy. How one person could find so much to criticize amazed me. I began to dream of quitting and opening my own coffee house, a cozy spot where I could make people happy by serving them espresso beverages and pastries. Upper management ended up hiring from outside the organization. While this decision had its sting in the moment, it was probably for the best. Our common status of being not chosen created a bond of sorts. Slowly, the tension cooled. How do I know? Just the other day, she asked if she could finish off the pot of coffee I made. Katherine Carlman is a wife, mother, writer, and instructor of writing. She writes on travel, parenting, and work issues while dreaming about one day escaping to the hinterlands with her husband in a tiny home.